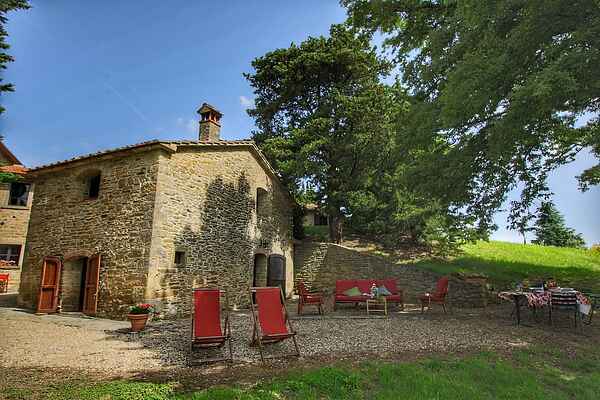 This small medieval hamlet from the fifteenth century with several rustic houses is a perfect place for a quiet holiday. The estate is in the hills between Umbria and Tuscany, close to the beautiful towns of Arezzo and Anghiari. The owner, a marquis, has lovingly restored the most beautiful houses and apartments of the hamlet, rustic and cozy. There is a communal garden with olive trees, lavender and a pool. A nice touch is that Leonardo da Vinci once painted the hamlet. In this beautiful area you can find many traditional trattorias with typical Tuscan food. There are hiking trails in the woods for hiking and cycling. Other lovely excursions are the monasteries and castles in the neighborhood. In this hamlet enjoying your real Tuscan life.